Safety in the workplace needs to be a top concern for every employer. In addition to creating a physical environment that meets current safety standards, it’s also crucial that your company has a culture of following safety protocol and proper reporting. No matter how careful you are, though, accidents can happen. When one does, use it as an opportunity to refine your safety program. Ensure that you’re in compliance with all safety standards and that your procedures are effective. If your employees handle or are in proximity to chemicals (i.e. 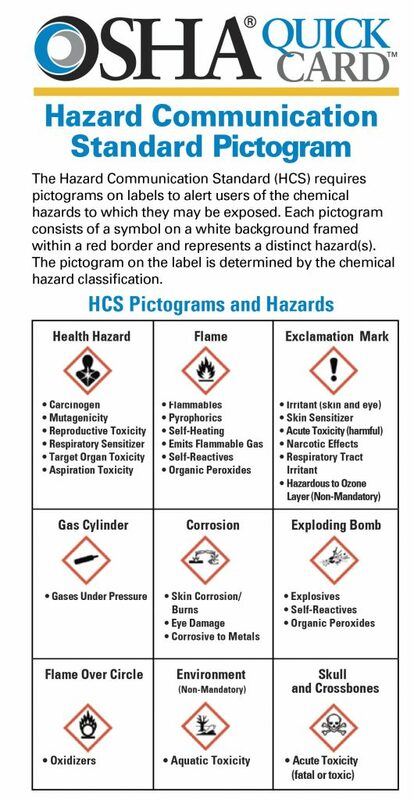 any substance that has an SDS), you must follow the Hazard Communication Standard (HCS), which has been updated to align with the Globally Harmonized System of Classification and Labelling of Chemicals (GHS). What that really means is that there is a single, specific standard by which chemicals need to be classified, and hazard information needs to be clearly communicated on labels or safety data sheets. * Sections 12-15 are not enforced by OSHA, as they are regulated by other agencies. In practice, the requirement is that the chemical manufacturer, distributor, or importer provide a Safety Data Sheet (SDS) for each hazardous chemical that clearly and consistently sets forth information for each of the sixteen categories. For detailed information on the specific requirements of each category, please see this OSHA brief. Employees should be trained on how to use the labels. For example, can your employees use the label information to follow proper storage requirements? Or, can they quickly locate first aid guidelines in case of exposure? Step 1. Select a responsible staff member who will have primary responsibility for coordinating implementation of the HazCom standard. That person should be familiar with the HazCom requirements and able to train and communicate it to other employees. Step 2. Prepare and implement a written HazCom protocol. There needs to be a written plan that addresses how hazard communication will be addressed, which includes an inventory of every hazardous chemical on site. Step 3. Label all containers. Labels must remain on shipped containers, and workplace containers must be labeled, as well, with all of the required information. Step 4. Maintain safety data sheets. There must be a data sheet for every chemical in the worksheet, and the sheets must be easily accessible by employees. Step 5. Information and training. Any employee who will be handling or exposed to a hazardous chemical in the workplace must be trained before the initial assignment, and every time a new hazard is introduced. Step 6. Evaluation and reassessment. As with any safety procedure or protocol, it’s essential that you review your procedures periodically to ensure that it is still working and remains the most effective way to keep employees safe. If there are any changed conditions in the workplace, those should be evaluated in context to make sure that if any protocols or safety measures need to be updated, that is done quickly and effectively.